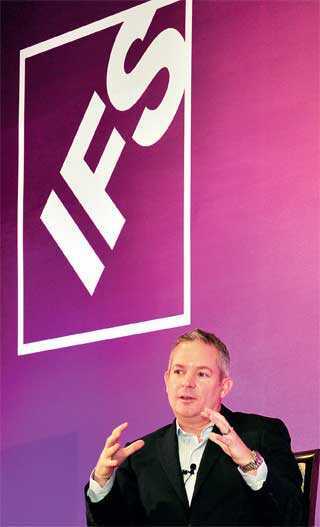 Darren Roos, Chief Executive Officer of the Sweden-headquartered global leader in enterprise software, IFS, was in Sri Lanka last month. 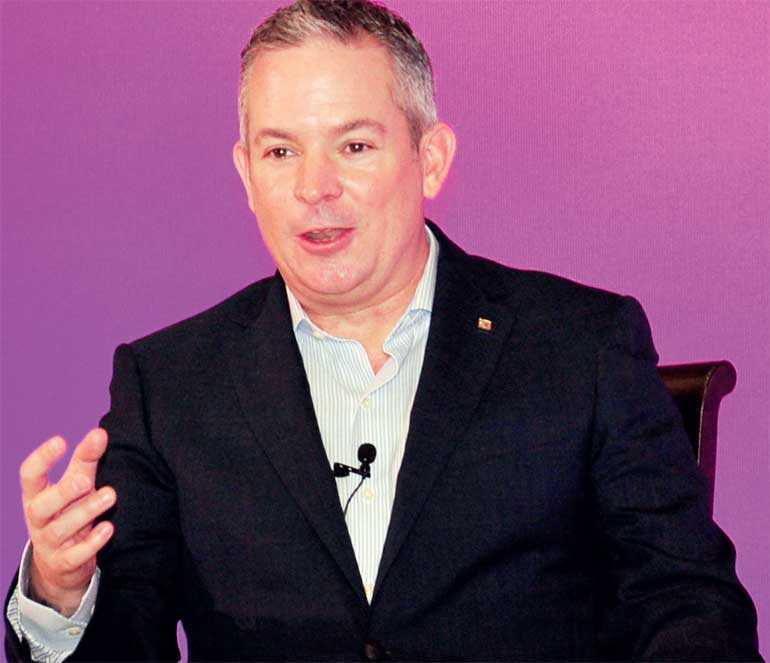 During his stay, he sat down with Daily FT for an exclusive interview where he spoke about the importance of IFS’ local office for its global growth, how delivering sensible next-generation ERP (Enterprise Resource Planning) solutions was making them a key differentiator against competition and IFS’ future plans for Sri Lanka. Q: Could you take us through IFS’ unprecedented growth during 2018 with cloud and SaaS (Software-as-a-Service) sales revenue growing by 300% as well as the net revenue of the organisation going up by 23%? We are at an interesting point in our evolution as a business, where historically we have been a very fragmented business. The business operated in quite different ways around the world and 2018 for us was really about consolidating the business so that everywhere we operate, we operate in a consistent market landscape. This enabled us to take businesses that historically were underperforming, and because they are copying best practices of businesses that are performing better, they started to perform better. So I think what we have been able to do is uplift the lesser performing businesses and that has contributed to the results that we have had. Yes, it has been a good year for us and 2019 will be an even better year. We effected a lot of change in 2018 and 2019 is a much more stable year for us. If I look at the Q1 outlook, we are going to get off to a great start so I expect 2019 to be better. Q: What are the key differentiators of your software, especially when you take your ERP suite with so many competing products in the market right now? How have these solutions helped the organisation to perform better? Today, customers are looking for three attributes. One is that they are looking for a solution that they can implement quickly. The days of people doing three- or four-year ERP rollouts are long gone so they want a solution that they can implement fast. The second thing that they are looking for is, they are no longer looking for something that just meets their requirement but needs to be upgraded in big upgrade chunks. It needs to be something that goes in fast and stays current all the time. We refer to it as evergreen so it needs to stay evergreen. The customer wants to implement the solution and then be able to get all of the next generation capabilities—artificial intelligence, virtual reality, the blockchain, internet of Things (IoT) and so forth—without having to do a big reimplementation. The third element is that they expect all of these capabilities cheaper than they have ever been able to get before, so with a lower total cost of ownership. That is what we bring for our customers. What IFS brings is a set of products which embed these attributes and we focus on how to bring the customers those three attributes, rather than being fixated on what we would have done or what the competitors are doing in the past. And the competitors tend to be slower and heavier and require big upgrades and have a higher total cost versus what we do. Q: IFS celebrated 20 years in Sri Lanka in 2017 and there was a leadership shift also to steer that whole expansion in South Asia. How do you see the contribution of the Sri Lankan market and the role of IFS Sri Lanka? I think it is not an overstatement to say that we would not be where we are without our Sri Lankan operation. They play a really critical role across our productive elements, global support offering, and global consulting offering and with our corporate infrastructure services. They are invaluable and when I joined the business, we had just less than 1,000 people and this year we will hit 1,300 going at 1,600. We have significant growth in Sri Lanka and we will continue to grow and the contribution that Sri Lanka makes is really important to the supporting services to our business. Q: Looking at emerging economies like Sri Lanka, during the last three to four years, these countries have faced severe macroeconomic turmoil and many challenges. What are the macroeconomic headwinds you are concerned about for your customers? Right now, I go around and talk to customers depending on where they are. In the US, obviously, they are very concerned about the trade wars with China and the impact on some of the raw materials that they have and the production cost that they have. In Europe, Brexit is clearly coming to the top of mind for everybody and every day it is creating a tremendous amount of uncertainty. Most of the CEOs I talk to are recognising that there is a tremendous amount of change beyond macroeconomic change; every industry is facing a challenge. There is a huge threat from non-traditional competition and they have to be prepared for that. In order to prepare for that, they need to have visibility in their own business so that they are ready to respond. Having a really good understanding of their supply chain and having a really good intimacy with their customers and understanding the pulse of their employees are important requirements for them to run their business today. That is why I think ERP solutions have become more relevant than ever. If you think about the first generation of ERPs, it was really about how we run our business more efficiently. ERP today is not just about how you run your business more efficiently but also about how you survive. How do you make sure that your business stays in business? How do we make sure that we can continue to exist as a business? This is what I believe. In emerging countries, they have a shift from being in a hyper-growth mode to not being in hyper-growth mode. It is a difficult transition but there is a counterbalance today in transition which is that because of globalisation and technology and the massive proliferation of digitalisation and online trade, there are tremendous opportunities for any company in emerging markets for them to compete in markets that they never previously would have had access to. They do not need huge capital reserves to enter into these markets. Today, I see a very different perspective of the world. People are thinking a lot more global, which is not a very surprising thing because of the way that technology has pervaded every industry. When I look at our offices today, we will outgrow the rest of the world by the factor of two in Asia. I expect our APJ (the Asia Pacific and Japan) businesses would grow; it would grow double the rate on a year-on-year basis. I think that is an indication of the way in which the Asian countries, in general, are adapting technology. We also see a lot of Asian and Middle East organisations are not tending to make some of the early mistakes that a lot of the Western companies made with first generation ERP solutions, so they are being able to go straight to newer and more agile technologies, which is a great opportunity. ​Q: What is Sri Lanka’s role in transcending the market instability and what is its role in this wider APJ expansion? From a go-to-market perspective, I think Sri Lanka has two distinctively different parts to the business, where we sell our software and then we have our engineering support. From a go-to-market perspective, we serve South Asia, specifically Pakistan, Bangladesh and Sri Lanka, from this office. Certainly, we see strong growth here and we expect it to grow faster. Using Sri Lanka as a hub and a centre of excellence, my ability to go-to-market in Pakistan and Bangladesh looks really effective for us. From a broader perspective, the fact that I have nearly half of the employees in Sri Lanka is a clear indication of the huge contribution that Sri Lanka will make. At the end of the day, in the same way, as my customers are having to think about how they get their business to be prepared for the types of changes that will come in the future, I think about it in the same way. What Sri Lanka provides us is a great source of talent at a reasonable price, with a very competitive combination of labour inflation and change. 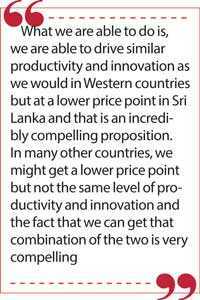 What we are able to do is, we are able to drive similar productivity and innovation as we would in Western countries but at a lower price point in Sri Lanka and that is an incredibly compelling proposition. In many other countries, we might get a lower price point but not the same level of productivity and innovation and the fact that we can get that combination of the two is very compelling. Q:Could you take us through IFS’ CSR initiatives in Sri Lanka and the progression of those initiatives? Historically, what IFS is really invested in is people development. It has been a good symbiotic relationship with the people that we are approaching so we have invested heavily in scholarships and internships and people development initiatives related to the people that we bring into our offices. What I have done is I have challenged the team on taking a broader approach now on how we give back to the community in Sri Lanka specifically. So what we have done is that we have identified rural areas where there is a population of about 60,000 people, I believe in the northern part of the country, with some of the basic amenities. What we are going to do is coordinate the efforts of our global IFS population to raise funds that we will then put into that community; the idea will be to make sure that we start providing basic things like water and sanitisation and basic healthcare to really taking care of the community through the next evolution—good infrastructure, putting in sustainable employment opportunities, proper education and so on. Many of us are really passionate about this and a lot of people are asking ‘why Sri Lanka?’ and whenever they ask me, I feel it is a very strange question because for me Sri Lanka gives so much to IFS. It is such a natural response for me to go but we are just reciprocating. It means that we would not have the business that we do if it was not for the contribution that Sri Lanka makes to IFS; it makes sense for us to give it back. Q:For the next quarter, what are the key plans you have in your mind for Sri Lanka? As I said, the big contribution that the Sri Lankan team makes is primarily around our global operations. While Shiraz and the team will continue to focus on the go-to-market component, it is really the part that Ranil runs that gives a huge contribution. There is a huge opportunity for us to continue to grow that and when I think about each one of those, we have about 60% of our R&D in Sri Lanka at the moment and there is an opportunity for us to certainly move that to 80%, which would be another 300 to 400 people being placed in our offices without any direct acquisitions. From a global support perspective, we are currently in the process of moving all of the headcounts to Sri Lanka so that we have a strong base of capability here. From a global consulting perspective in Q1, our last year’s revenue will grow nearly 50% year-on-year and our cloud revenue continues to grow in triple digits and our ability to support those customers from an implementations perspective is critical. There is no point in selling software to customers if they cannot implement it. What we see now is that we have a fast-growing partner ecosystem that is helping to support us in that growth. Those partners are also looking for resources; they need training and they need enablement and there is a critical role that Sri Lanka can play around both training and doing enablement. This also builds a large number of new resources to support our projects that they can go into the ecosystem and do the implementations. I think the potential for us to continue to expand our operations here and potentially to employ many thousands of people is high.